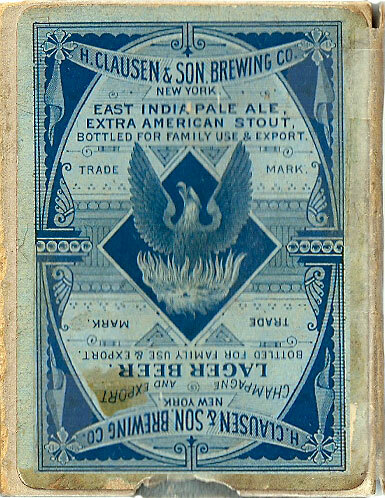 WoPC Home > U.S.A. > American P. C. Co > Clausen & Son Brewing Co.
H. Clausen & Son Brewing Co.
Advertising playing cards produced for the Clausen & Son Brewing Co., New York, believed to have been manufactured by the American Playing Card Co., New York, c.1885. 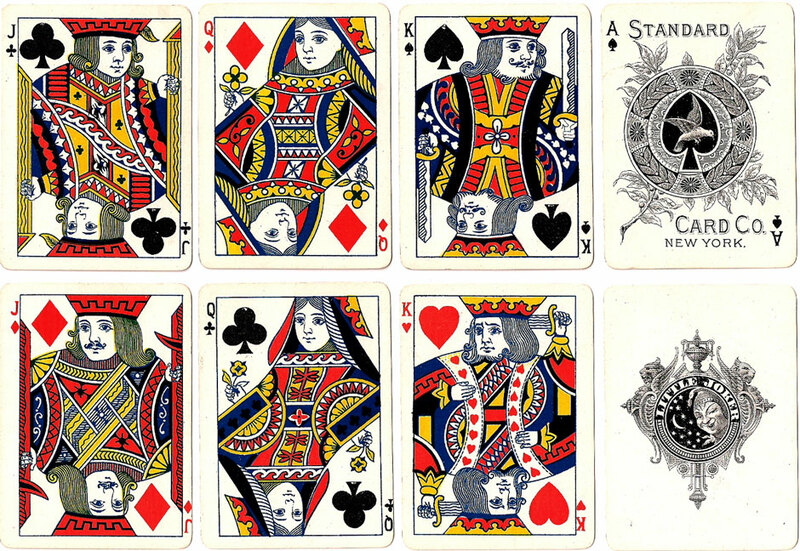 Although the Ace of Spades suggests otherwise, the Joker and court cards are identical to examples produced by this manufacturer since c.1876. There never was a Standard Card Co. in New York. There was a Standard Playing Card Company in Chicago but this not one of its decks. It was a common practice for card makers to produce decks under fictitious names particularly when producing advertising decks. This was to avoid promoting their own name at the expense of the client who was paying to advertise their own product. 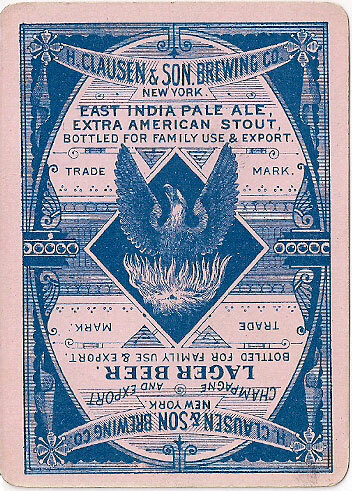 Above: Advertising deck produced for H. Clausen & Son Brewing Co., believed to have been manufactured by the American Playing Card Co., New York, c.1885. The back design is coloured differently from the sample on the box. As often happens, some one had two decks with contrasting backs and inadvertently switched the boxes. In 1855 Henry Clausen established a brewery under the name of Henry Clausen’s Phoenix Steam Brewery. In 1866 he was joined by his son, Henry Clausen, Jr., and the name of the firm became H. Clausen & Son. 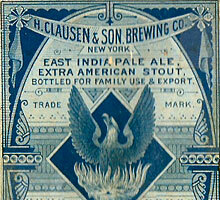 In 1882 Henry Sr. retired and the name of the firm became H. Clausen & Son Brewing Co. In 1888 the firm consolidated with Flanagan, Nay & Co. under the name New York Breweries Co. That company was eventually taken over and operated by a British syndicate until 1908 at which time the syndicate liquidated its holdings in the company. The company continued in business under the name of Clausen-Flanagan Breweries until it closed its doors in 1910. Based on the above, it is clear that this deck must have been made between 1882 and 1888. Starling, Rod: An Advert for Advertising Decks, in 'Clear the Decks', the Newsletter for 52 Plus Joker (edited by Judy Dawson), June 2007. All images and accompanying notes courtesy Rod Starling.